You need look no further if you don’t have a glimpse of idea on how to get our products working. Read the step-by-step instructions before using our products and you will discover the quick answer to what you are looking for. You may find a beginner's step-by-step guide on how to effectively use DVD Ripper, Video Converter, DRM Converter, DVD Cloner, and other products you may concern. Check them out and be an expert on our products soon. Provide you the most convenient way to convert audio files, extract audio from video and convert YouTube video to audio. These instructions would show you how to create audio file from various resources and enjoy any beautiful music on MP3 player and other portable devices. How to Extract Audio Track From Online Videos, Like Facebook, Metacafe etc.? How to download and convert Metacafe music/videos to iPod music file formats? How to Convert WAV to MP3 with Any Audio Converter Freeware? 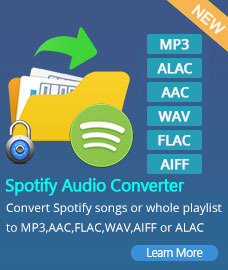 How to Convert from WMA to MP3 with Any Audio Converter Freeware? How to Cut or Merge MP3 Audio Files? 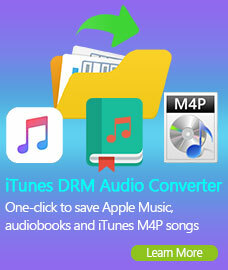 iTunes DRM Audio Converter is the best iTunes audio converter to convert DRM-ed Apple Music files, M4A/M4B/AA/AAX audiobooks and M4P music files to plain MP3,AAC and WAV formats. It can works as Apple Music Converter, Audiobook Converter and M4P to MP3 Audio Converter. What's more, it can convert music files at 20X faster speed with lossless quality kept. Spotify Music Converter is a well-designed audio converter for Mac users to convert Spotify music to mp3 or aac format with 5X faster speed and good output quality. As a professional music converter for spotify, Sidify Music Converter will encode Spotify music to mp3 or aac while recording. Just a few clicks and you can convert Spotify music quickly and easily. Syncios Manager is a powerful iTunes alternative and iOS manager, trusted by millions Apple users. It can help you backup and restore your iOS device with a few clicks as well as transfer data between your Mac and iPad/iPhone/iPod without using iTunes. Besides, you are able to use your iOS device as an external USB Key for extra convenient storage and tranfer data between two iPods, iPad to iPhone and etc. Syncios Data Transfer backs up and restores to and from your computer all the important information and media files stored on your smart phone or any other Android device. The program will save in a folder on your PC any videos, images, contacts, apps, and even call logs stored on your phone or tablet without any quality loss. Want to cut a clip from a DVD movie? Want to share your DVD movies on Internet or just simply enjoy your DVD movies on portable devices wherever you go? Here are some instructions you may follow to get the most out of your DVD movies. Trying to figure out how to convert videos among various formats to fit your individual multimedia devices? These guides below will lead you through the editing and converting process from video to video and video to audio. Trying to figure out how to remove DRM protections and convert iTunes video and music to unprotected formats so that you can play your iTunes Store purchases on any computer and multimedia devices? Here you go, check out our tutorials to enjoy DRM-Free media files. Want to backup DVD movies to your hard drive? Want to make excellent backup copies of your favorite DVD movies? DVD Cloner software is exactly the application you need. The following guides will walk you through how to accomplish this task. Find Cool free software, Apps and Games for your iPod Touch. Find ways of how to convert your favorite DVD movies and videos for playing on your iPod Touch or iPod Nano, transfer your music, videos and photos between iPod and your computer skipping iTunes, backup or share them with your friends with just 1-click. Cool free software, Apps and Games, explore some of your favorites and see how they allow your iPhone to do even more. Learn how to enjoy your favorite DVD movies and videos on your iPhone, make custom ringtones to let your iphone sing your song; transfer your music, videos, photos and ringtones between iphone and your computer skipping iTunes. Convert Videos, Youtube Videos, Metacafe Videos to iPhone 5 Music File Formats? Is there a way to transfer and play protected iTunes music video on your iPad? How to remove drm protection from wmv, wma files and play them on iPad? Here you can find the answer. Keep reading, you will also learn how to enjoy DVD movies on your 9.7-inch display iPad and transfer music, videos and photos among iPad, iTunes and your computer freely. The PSP system is the truly integrated portable entertainment system designed to handle multiple applications – games, music, video, photo, Internet, and wireless connectivity. Although game is the key feature, music, video, photo, Internet will help making the most of your device. Learn how to convert DVD movies and videos for your PSP. Although you purchased movies or music from iTunes, you don't really own them because of iTunes DRM protection. Have no worries. Here we're talking all about iTunes DRM removal tips. Since multimedia devices have become a vital part of our daily lives, you may wonder how to improve the experience with our multimedia companions. Get some useful tips on how to make your media files awesome on portable devices. Trying to find out the best DVD ripper, video converter, audio converter and DVD copy software? Here you go, check out our editorial reviews on these software tools. Glossary explains thoroughly all kinds of video, audio and DVD formats. With this glossary knowledge in mind, you may find it's getting easier while enjoying media sources. DVD, DVD5, DVD9, DVD-R, DVD+R, DVD-RW, etc. 3GP, ASF, AVI, MPEG, MOV, RM, WMV, DivX, XviD etc. AAC, M4A, M4P, OGG, MP3, ID3 Tag, WMA, WAV, etc.